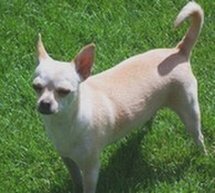 Tinkerbelle Chihuahua is a beautiful Fawn colored, smooth coat Chihuahua. Very easy going and loving. She is bred by our stud Sir Rascal, a very sweet Long Hair, pictured here on the right. Tinkerbelle normally produces 5 - 6 pups, most all have that Cream/Fawn coat as she has; some develop a darker tan like Sir Rascal. There is generally a mixture of both long and smooth coat puppies in each litter. All her pups are adopted very quickly. Below is a picture of a pup from a past litter. Short Tan coat with White marking on head and paws. She is applehead with a short nose and legs, weighed 3 pounds at 11 weeks. 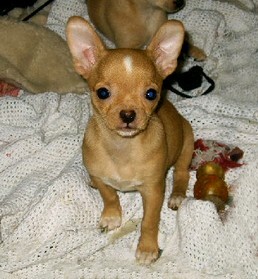 A very playful and loving little girl with big beautiful Chihuahua ears and eyes.